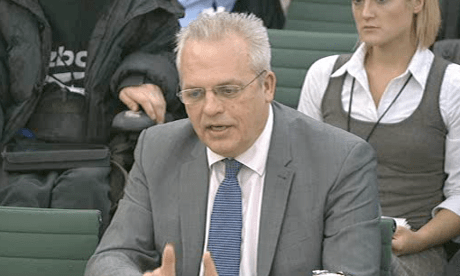 Here’s a little taster from Iain dungcan (no…not a spelling mistake) Smiths appearance at todays Work and Pension Committee. It started at 4.30pm ish so is still ongoing. 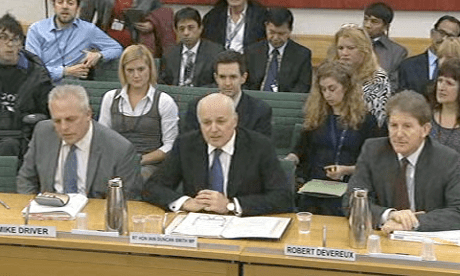 Apparantly, IDS said “with respect” to the committee 5 times so far…. which as we all know, means he’s got NO RESPECT at all. “Since the coalition came to power, the level of in-work poverty has been relatively stable. But there was a 500,000 increase while Labour was in power”. Q: So press reports of constant disagreement are wrong? (Teresa Pearce LAB)Duncan Smith says they are “ludicrous”. The DWP and the Cabinet Office are working closely together. Duncan Smith says the cap was partly about saving money. But it was partly about promoting “cultural change”. He would never have guessed that so many people would have moved into work. Dame Anne Begg says that in Aberdeen, where she is an MP, most people affected are in temporary accommodation. That means their housing costs get picked up by the council. Are you sure that the savings you claim aren’t offset by other costs elsewhere. He says the benefits cap was never meant to save “staggering amounts of money”. It was about changing behaviours, he says. And that’s it. It’s over. I’ll post a summary shortly. Labour’s Debbie Abrahams goes next. 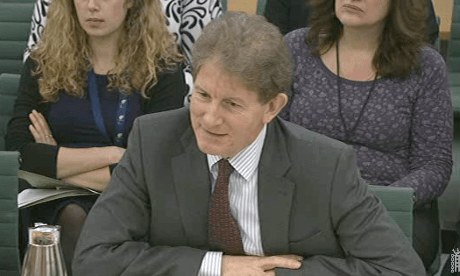 Q: At December’s hearing I told you about a whistleblower who said benefits staff were under pressure to sanction people. After that I was inundated by comments from people, claimants and staff, making the same point. Have you had a look at this? The Mirror’s Tom McTague has summed up this hearing quite well. Labour’s Teresa Pearce goes next. At last week’s public administration committee, Atos says PIP assessments were taking twice as long as planned, she says. He says he has had a “rolling pilot”. Told that it takes three days to process universal credit payments,Theresa Pearce says the DWP should negotiate a better deal with the banks. Labour’s Theresa Pearce is asking questions now. Q: What’s the Cabinet Office’s role now? Duncan Smith says they are “ludicrous”. The DWP and the Cabinet Office are working closely goether. Q: You said you would be testing 100 people for the “digital solution” by the end of this year? Q: What is the “digital solution”? Duncan Smith says it develops as it is going along. It is developed within an agile approach. (That’s a way of managing IT systems.) It will involve a collective memory in the digital cloud. Labour’s Sheila Gilmore goes next. She says she is “still in the fog” in relation to costs. Labour’s Debbie Abrahams says she is unhappy with the “hubris” shown by the panel. People watching would be conceerned, she says. They clearly have not explained themselves to the committee. Labour’s Glenda Jackson goes next. Dame Anne Begg talks about universal credit costs being written off. Duncan Smith says she’s wrong. She is referring to costs being written down. That is different. Every company he has ever worked for has had to write down costs, he says. Dame Anne Begg mentions another committee hearing last year. At that hearing Duncan Smith did not mention the universal credit “reset” (a review of its implementation). Why not? Dame Anne Begg says as a matter of courtesy parliament’s scrutiny committee should have been told that the plans were being reviewed. At the end of last week the Institute for Government sent out a briefing note saying the DWP’s universal credit programme was a classic example of the “accountability muddle” that sometimes afflicts Whitehall. 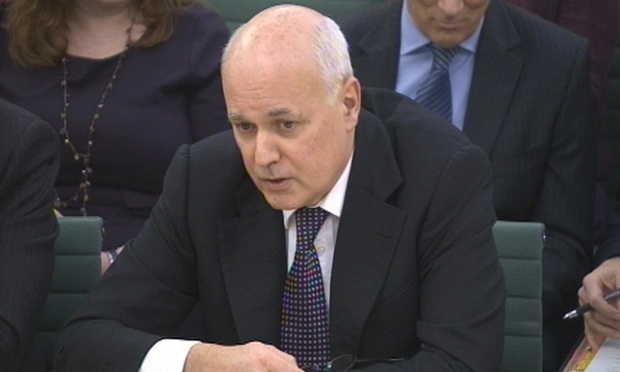 The work and pensions select committee’s session with Iain Duncan Smith is due to start shortly. • Mike Driver, the DWP’s director general for finance. This entry was posted in Uncategorized and tagged Anne Begg, Debbie Abrahams, Glenda Jackson, Ian Duncan Smith, Universal Credit, Work and Pensions Committee. Bookmark the permalink. Absolutely. Maybe he does not understand English and prefers Spanglish as when you listen to him on `Prime Minister’s’ question time ,he understands very little, about a lot. Ha ha … he is an idiot. How dare he talk to Our Glenda like that, she’s a National Treasure and unlike him…she was very successful in her former career. Few in modern British history have come as far or achieved as much from humble beginnings as Glenda Jackson has. From acclaimed actress to respected MP (Member of Parliament), she is known for her high intelligence and meticulous approach to her work. She was born to a working-class household in Birkenhead, where her father was a bricklayer. When she was very young, her father was recruited into the Navy, where he worked aboard a minesweeper. She graduated from school at 16 and worked for a while in a pharmacy. However, she found this boring and dead-end and wanted better for herself. Her life changed forever when she was accepted into the prestigious Royal Acadamy of Dramatic Art (RADA) at the age of 18. Her work impressed all who observed it. Well I never knew that! Good for her, she’s worth a hundred of the odious little twerp that is IDS. 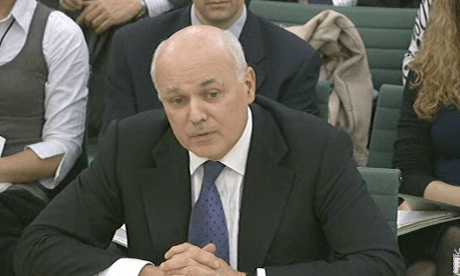 Can’t believe that IDS said that to Glenda Jackson ….. do the words pot, kettle, black mean anything to him do you think?